Changing your transmission fluid is very similar to changing your oil. Over time, transmission fluid will break down and . need to be changed to prevent the breakdown of your actual transmission. This 20-30 minute fluid service will help to prolong the life of your transmission and prevent costly mechanical repairs in the future. 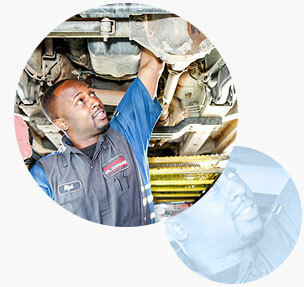 All vehicle manufacturers recommend regularly servicing your transmission filter. The specific mileage interval recommendations for your vehicle can be found in your vehicle's owner’s manual. At Express Oil Change & Tire Engineers, for most vehicles, we remove the transmission pan and clean out a portion of the old fluid, which may have built up in the transmission; then we replace the old filter and pan gasket for you. Transmission flush service utilizes specifically-designed equipment we hook up to your transmission then, with the use of custom-blended chemicals, we safely power-flush out any old fluid and contaminants. In this 30-40 minute service, we pump in fresh transmission fluid, along with proprietary conditioners to revitalize the seals and O-rings of your automatic transmission. Within this 75-minute service, we will perform a combination of the transmission filter service and the transmission flush and fill service as one complete service. This service replaces practically all of your vehicle's old transmission fluid with clean, new transmission fluid, and replaces your filter and gasket.